Thanks to skeletal data from recent CT scans and radiocarbon analyses, a forensic artist from John Abbott College and physical anthropologists from Western University were able to reconstruct the faces of the mummies. 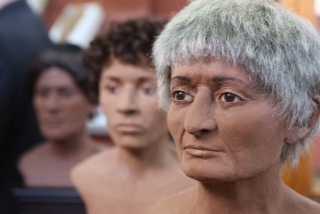 The results of this facial reconstruction project show a young man and a young woman, as well as a white-haired matron, as they all might have appeared before their deaths. These facial reconstructions will be unveiled on Friday, January 25, 2013 at the Redpath Museum at McGill University and will be featured as a new display in the World Cultures gallery starting in February. In 2011, all three mummies were CT scanned at the Montreal Neurological Institute and Hospital -The Neuro, to produce high-resolution 3D radiological images as part of Western University’s IMPACT Radiological Mummy Database Project. Anthropological analyses of the scans produced information about the demographics, social statuses, and medical ailments of these three ancients, providing insight to help understand how these people lived and how they died. Two thousand years later, we are able to look at the faces of three Egyptians who believed they would live on forever after death. The facial reconstructions were undertaken by a forensic artist at John Abbott College (JAC) and physical anthropologists from Western University. Using 3-D printing technology normally used in manufacturing and rapid prototyping provided by the Engineering Department of JAC, the team changed digital information from medical CT scans into solid 3D models of each mummy’s skull and jaw. Egyptian tissue depth data derived from ultrasonic imaging of modern Egyptians were used to flesh out the faces. A diversity of skin tone is shown to reflect the Mediterranean, North African, and Sub-Saharan mixture of the Egyptian population as noted throughout history. Hairstyles were pulled from earlier anthropology reports and detected through the wrappings worn by one of the mummies. Radiocarbon dating of both Theban mummies overturned long-held assumptions erroneously dating them to the New Kingdom period (1550-1070 BCE). The date for the female Theban mummy was subsequently revised to the Late Roman Period (230-380 CE) and the Theban male mummy to the Ptolemaic Period (332-30 BCE). Analysis of the hairstyle visible in the scans of the third mummy helped to narrow down its date to the mid-Roman Period (96-161 CE).